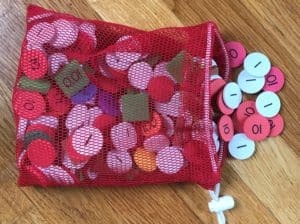 You are here: Home / Implementing Singapore Math / Ask the Experts: What’s the best way to organize my math manipulatives? 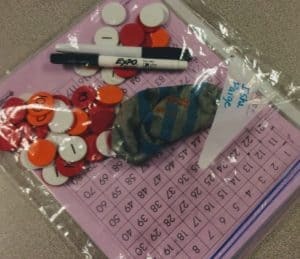 Ask the Experts: What’s the best way to organize my math manipulatives? The answer to this question is complicated. So much of how to organize materials is dependent upon personal preference with procedures and arrangement within your classroom. One thing that I can say is true in all cases is that they DO NOT belong in the closet! I highly recommend that you dedicate a shelf or area of your classroom to math materials. It’s equally important for students to choose the most appropriate tool, as it is for them to use them. Having materials out for students at all times will allow for that. One of the joys of my job is that I get to visit schools and classrooms across the country. So, I will share with you some organizational tips that I have gathered from my journeys. 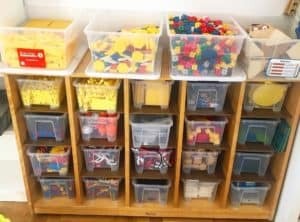 There are three schools of thought (no pun intended) when it comes to organizing manipulatives; individual kits, group kits or community tubs. You may find it helpful to use a combination of the three, depending on the item. I’ll mention a couple of manipulatives specifically here. Many teachers prefer to organize discs into student kits. The idea being that students will have easy access to the discs for lessons with minimal time getting discs out and cleaning them up. This option works great if you have enough discs for each student to have 20 of each place value; 20 ones, 20 tens, 20 hundreds, etc. Students are expected to keep these baggies or boxes of discs in their desks. Like student kits, you’ll need 20 of each place value in each kit. With group kits, you don’t need as many total discs. The idea here is that students will use discs with a partner or in small groups. These kits can be stored in a community tub and pulled out for use during lessons. In this case, discs are organized by place value into tubs. So, you would have a tub of ones, a tub of tens, and so on. In each tub, you can keep a set of small cups (Dixie cups work well) for students to take a scoop of the discs when needed. Clean up is a snap. 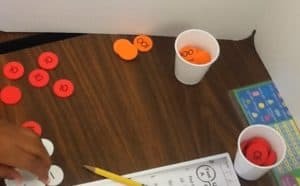 Students simply dump the cups of discs back into the correct place value tub. Cons: Requires a bit more practice with the procedure of gathering and returning discs to the correct tub. Linking cubes are a multi-functional manipulative that each classroom should have. For a class of about 20 students, you’ll want to have at least 400 individual cubes. That’s enough for each student to have a set of 20 when needed for instruction. If you’re using them for modeling area or multiplication arrays, you might want double that amount. You’ll want to put at least 20 in each kit. Cons: Whose cube is this?!? If you are keeping your cubes in tubs, for ease of passing out and cleaning up, organize them in rods of 10, preferably by color. That way you can quickly pass out 2 rods (or more) to each student or partner group. Pros: Fewer materials in student desks. No more mystery cubes. 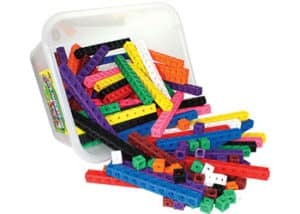 Other manipulatives should be in tubs on a shelf in the classroom available to all students at all times! If you have any organizational tips from your classroom that you’d like to share, please send us a comment.